Get your Moana crafts and recipes ready because the film is out and ready for your family to have an epic movie night. Moana is available on Blu-ray and Disney Movies Anywhere as of March 7th. Thanks Disney for giving me a free movie night kit to host an in-home viewing of Moana. All opinions are my own. Moana presents the perfect opportunity for a family movie night involving everyone. The focus theme of Moana is family and connecting with ancestors, so it makes sense to gather the whole tribe! When involving family of all ages in your movie night, it’s wise to have activities planned in case anyone gets restless. Plus, it’s just fun to do movie-themed crafts and eat treats inspired by your favorite flick. We received a Google Chromecast to view the movie. This little gadget allows you to “cast” the movie over different devices and use your phone as a remote. For example, if the kids start a movie at home, transfer it to their tablet if you need to run to the store. Meltdown avoided. Sync the Google Chromecast with different apps to work together. We used the Disney Movies Anywhere app to view this digital download of Moana. This way of movie-watching is ideal these days. 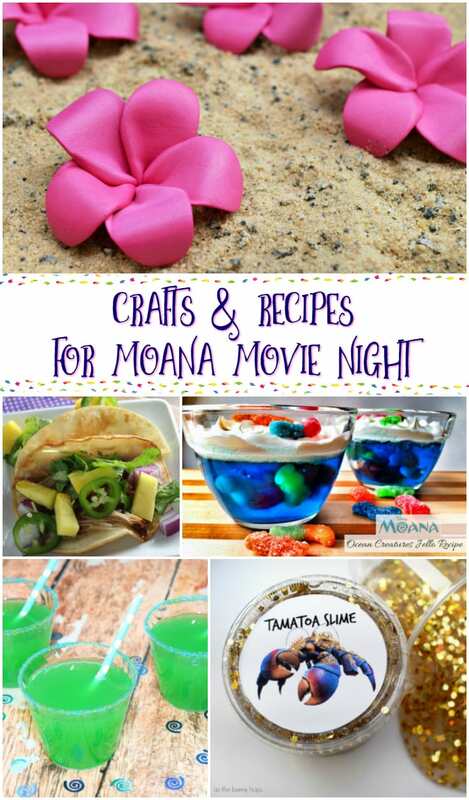 Here are some Moana crafts and recipes to make your movie night epic! Crafting something inspired by your favorite movie or movie character enhances the fun for the little ones. I mean, even us older girls want hair flowers after seeing them on gorgeous Moana! So, we ate deep dish pizza, but I really regret not making something a bit more fitting. This is a movie that will be watched a lot more than once, so we will remedy that next time. The movie merch available for Moana is some of the cutest ever, also. Get a light-up fish hook, a signing necklace, an adorable stuffed Pua, and so much more. Be sure to watch Moana with your family. The movie is available on Blu-ray and digital download now! That would make a fun movie night. Haven’t looked into the Google Chromecast thingy. I saw Moana in the theatre with my sister-in-law, but my husband hasn’t seen it yet. I was thinking about making some sweet and sour chicken for him and sweet and sour tofu for me to enjoy while watching. The tacos look pretty good too, although mine would be tofu. I will definitely have to make those Tamatoa cupcakes as well, because I too cannot resist anything shiny! Moana is such a good movie and I love watching it with my niece. I also like the crafts. We will have to try some of them out! I like the slime and the flowers. The cupcakes would be a hit at my house. 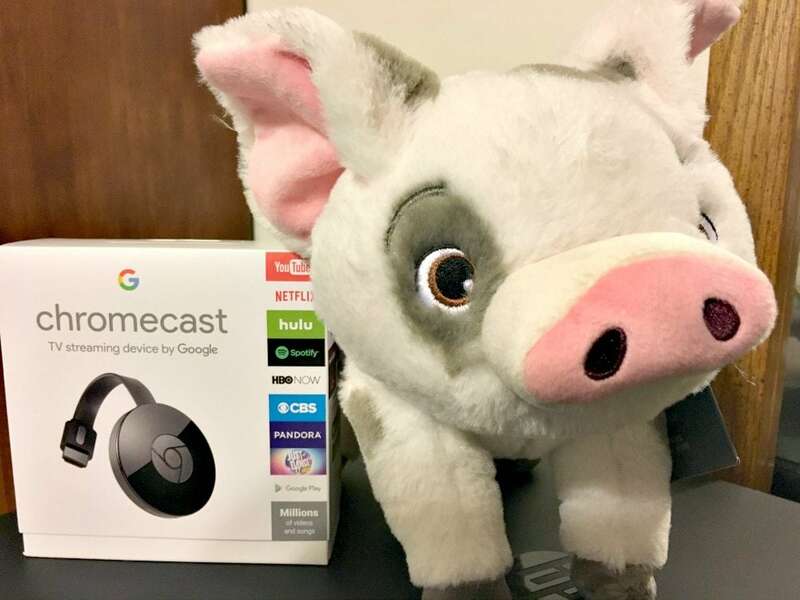 Moana is a fun movie and I like the idea of the Google Chromecast to be able to switch the movie location. Perfect timing for me to find this post; we are having a Moana movie night at my daughter’s school this weekend.